MG University degree CAP 2014 first allotment results has been published at the official website on 20th June (Friday). After the confirmation of the first allotment, students should have to remit the fee due to University at designated branches of SBT before the specific time. The allotment has been published on www.cap.mgu.in. Candidates, who had applied for the courses, can check the first allotment by logging in the official CAP portal of the University. Mahatma Gandhi (M G) University has published the first allotment for UG degree admission at the official admission website. The allotment list for admission to degree courses in affiliated arts and science colleges of the University is now available at www.cap.mgu.in. 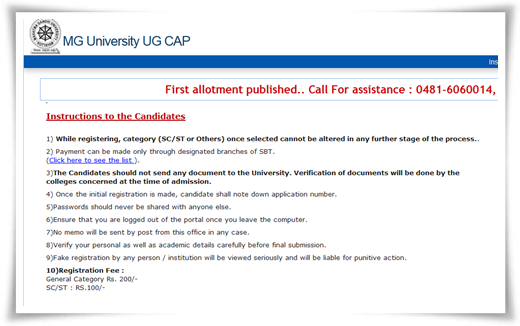 To find the first allotment status, candidates should visit the online portal and need to login in their UG CAP profile page using the application number and password. After the verification of the first allotment, students should remit the fee due to University at designated branches of SBT before the specific time and report in the allotted college for admission. After the publication of the provincial rank list trial allotment, students were given ample time to modify, rearrangement/addition/deletion of options. Applicants can also take time to rearrange and delete the higher option. In a week time, a second allotment will be conducted to fill the vacancies. The first special allotment for the SC/ST candidates will be published during the first week of July 2014. The second special and supplementary allotment results will be followed later. The classes for first year degree course would commence by the 2nd week of July. During this period, the admission to applicants for the community and management merit quota will be done. The rank list of the candidates for this category will be published on the college notice board. The admission process finishes by the last week of July making an end to the 2 month long method of selection. With more than 21,000 seats offered for various courses in colleges under the University, new course will be added to it giving more opportunities for students to pursue their education. It is know that students from other parts of the country have applied to undertake course for the current year. As the seats to different courses in colleges are filled through the Centralized Allotment Process (CAP), it has given freedom to know the admission status online with ease. To know about the allotment stauts, visit the official CAP web portal of Mahatma Gandhi University. Mahatma Gandhi (M G) University admission 2014 – 15 with details about the notification and other information is given here. Mahatma Gandhi University commonly known as M G University has invited applications for the admission of under graduate programmes in the affiliated Arts & Science Colleges / Constituent Colleges for the academic year 2014-15. This notification is applicable for all UG programmes except the Fine Arts and as the admission is based on entrance examinations. M G University degree admission course trial allotment 2014 results list will be published on 30th May. As the registration process gets completed on 27th May, the University would make all arrangements to publish the trial allotment. The provisional index mark and trial allotment list for admission to degree courses in affiliated arts and science colleges would be published by the University on 30th May 2014. M G University CAP trial allotment result(list) 2014 has been published at admission website www.cap.mgu.in. Mahatma Gandhi University (Kottayam) CAP degree 2014 Provisional Rank List & Trial Allotment has been published in the website which can view and could be modified. Students can modify, rearrange options from 14th June. The first allotment is expected to get published by the third week of June.